Christopher Barbour leads us into the world of British lightweight touring bikes. 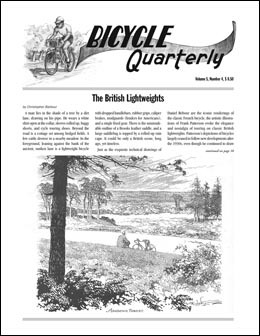 Illustrated with Frank Patterson’s evocative drawings, the article made me want to head to the leafy lanes of Britain… To complement this article, Elton Pope-Lance presented three classic machines: a 1951 Flying Scot, a 1953 Claud Butler Jubilee and a 1957 Maclean Eclipse. Hilary Stone shows seven machines with “unorthodox” frames, from a magnificent 1930s Flying Gate via an amazing Paris Galibier to a classic Thanet Silverlight. Flash Weldon explores the history of Hetchins, the maker famous for elaborate lugwork. Chris Kostman takes you on the Lake Pepin 3-Speed Tour, a precursor to the popular “Tweed Rides” of today. We report from the 3rd North American Handmade Bicycle Show and look at how a bicycle should be engineered. We explore how to triangulate frames and racks, how to design connections so bolts don’t come loose, and how to avoid stress risers. To complement this analysis, Peter Weigle talks about different frame designs for women’s bikes in his Builders Speak article.